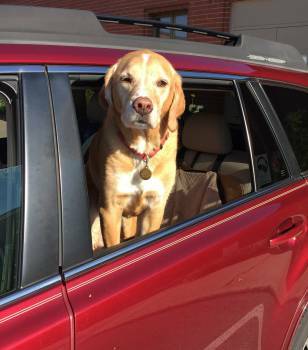 Delilah, age 12, is our official greeter and often "rides shotgun" with Robin, delivering promotional products and printing to our customers. She is a Lab/bird dog mix and was rescued from a humane society in Iowa. If you see her riding with Robin, she loves dog biscuits, and has now decided that staying home is preferable to running away.